Located at the confluence of two rivers and within three distinct wine growing regions is Valladolid, Spain. 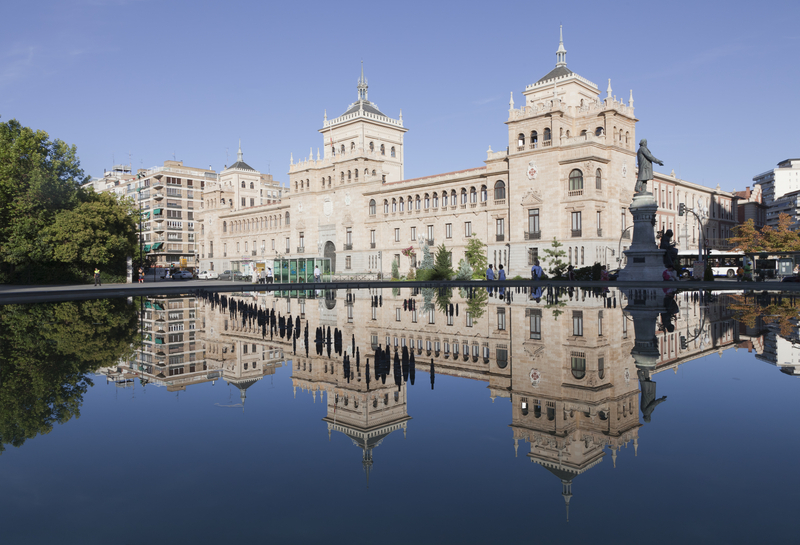 This delightful city is a wonderful day trip from Madrid. Valladolid and the surrounding countryside grew in population and importance after the Christians re-conquered the area from the Moors in the 10th century. Valladolid was the residence for the Castilian kings and until 1561 it was the capital city for the kingdom of Spain. It was in this city that King Ferdinand and Queen Isabella were married and Christopher Columbus passed away. Visitors who travel the 200-kilometers from Madrid might want to leave their hotel or Madrid apartments early for the 3 hour drive to Valladoild. Travelers will find the early get up well worth the trip, for they will find a delicious local cuisine that includes fish, cheese, bread, pastries and the area’s famous lechazo or baby lamb. Here you will find Spain’s best lamb’s cheese and pastry shops that produce the popular and well known St. Mary’s rings and St. Claire sponge cakes. Guests can sample the Cigales, Rueda and Ribera del Duero wines. If you prefer to sightsee, you can visit the parks along the river or the Plaza Mayor that was used as a template for the main plaza in Madrid. You will also find many fine examples of 15th and 16th century Gothic churches. You can visit the unfinished Cathedral that was commissioned by King Phillip II, the Benedictine Church of San Benito and the Dominican Church of San Pablo. These religious sites display intricate Baroque facades, Romanesque reredos and Gothic statuary. You can see the home where the novelist Cervantes finished writing Don Quixote and the final home of Columbus, which is now a museum featuring the discovery of the New World. You can experience the artworks on display at the National Sculpture Museum or explore the exhibits of the Science Museum. Guests can visit the Royal Palace that was the birth place of King Phillip II and home to Napoleon during the Peninsula War. Valladolid also has archeological remnants of a Roman camp and palisade walls. The continental Mediterranean climate generates cold winters and dry hot summers. In general, the average temperatures in the city enable tourists to comfortably visit year round. Whether your interest is history or architecture, culture or cuisine, Valladolid is a magnificent adventure located just three hours from Madrid. If staying in one of the many hotels or apartments in Madrid for any length of time, one might make this a 2 day or weekend getaway from the city.